Character. Cost: 4. STR: 5. 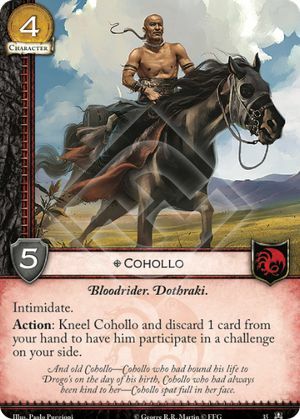 Action: Kneel Cohollo and discard 1 card from your hand to have him participate in a challenge on your side. And old Cohollo - Cohollo who had bound his life to Drogo's on the day of his birth, Cohollo who had always been kind to her - Cohollo spat full in her face. Kings of the Isles #35.